This past week on the tour, our focus has shifted from the study of World War I to the study of World War II. The World War II section of our trip started with Canada’s first actions on French soil: the D-Day landings of June 6th, 1944. We visited Juno Beach, which was assigned to the Canadian military, Sword and Gold beaches, assigned to the British, and Omaha and Utah beaches, assigned to the Americans. Today we started to follow the Canadian advance south from Juno Beach through Normandy. We started the day at Pegasus Bridge, where Canadian airborne units landed on unpowered gliders to capture the important bridge by surprise at 12am the morning before the D-Day invasion began. We then spent some time in Authie, near where a front was established between Canadian ground troops and the notorious German 12th SS Panzer Armoured Division. At these two locations we had the unique opportunity to meet men who had lived through important moments in these immediate areas, their stories I share today. After visiting the Pegasus Bridge site, we visited the Pegasus Bridge Memorial Museum. This museum housed the original bridge that British soldiers captured on the morning of June 6, 1944, and also told the story of how the operation transpired. 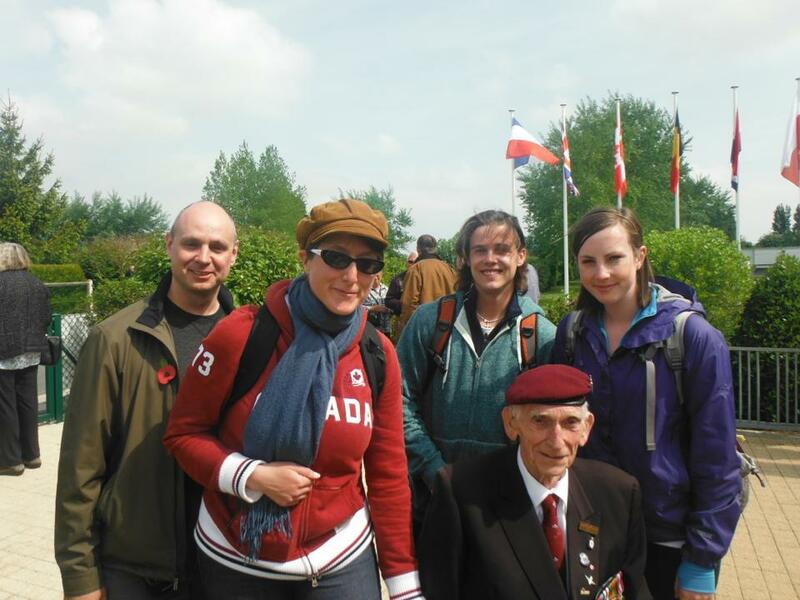 Eric, our fellow tour participant, told us that he recognized a veteran, Douglas Baines (left), who was visiting the museum in full uniform as one of the airborne soldiers who participated in the Pegasus Bridge operation, and that his bio was mounted on the wall. We eventually went up to talk to him to ask him for his story. He happily told us that he landed with the 12th Parachute Battalion in the early morning on D-Day. As was common for airborne troops on this day, the whole battalion was scattered around the drop point, some landing far off target. Weapons and equipment were similarly scattered. In these confused early hours, the soldiers tried to rally and locate their equipment. The best this war veteran could do was find one fellow soldier, and, realizing their vulnerability without the rest of their unit in enemy territory, the two took shelter in a French farmer’s shed. Eventually, they were routed out and captured by German forces, and sent on a train to a prisoner of war camp. He escaped from the train, and after a distinguished service record with the French Resistance forces, he rejoined the 12th Parachute battalion and continued to participate in Allied operations. The persistence he demonstrated to continue to fight the war after being captured shows his dedication to the war effort. He is a well deserving decorated soldier. In the town of Authie, as we were examining a street called “Place des 37 Canadiens,” we met a man who had been living just across the street from the spot for almost 80 years. As the Canadians settled into the bloody battle that would unfold in the vicinity of Authie, word started to reach them of their brutal opponents, the 12th SS Panzer Armoured Division. This division was composed of a group of National Socialist ideologists who truly embodied the troubled morals of the organization. This unit had already acquired a reputation for committing war crimes. Throughout the total time of the encounter between the Canadians and the 12th SS in Normandy, the 12th SS murdered just under 150 Canadian prisoners of war. The man who found us at the “Place des 37 Canadiens” street sign delivered a gritty firsthand account of the cold-blooded murder of 37 Canadian prisoners of war who had been removed from the battlefield after surrender in his village of Authie in 1944. The murders occurred in the very square we were standing in. Indeed when Canadians started to repel the 12th SS Division and discovered the graves of their murdered comrades, the fighting became even more personal. This may have lent them the vigor to continue to fight harder against the 12th SS, which eventually ended in victory for the Canadians after weeks of bloody fighting. On Thursday we will be visiting the Abbaye d’Ardenne, a site where about 20 more Canadian prisoners of war were beaten to death at the command of 12th SS officers. Visiting the site of these tragic events has had the group reach an emotional tone on the level of the most shocking war graves cemeteries we have visited on this trip. To convey the importance that war graves cemeteries have played throughout the tour, today turned out to be the first day on the tour that we did not visit a war graves cemetery. These cemeteries are spotted amongst the French country side, which houses about 2500 Commonwealth War Graves sites. The opportunity to meet these two men and hear their personal stories has given us the opportunity to experience the history that we study first hand. Our group of history enthusiasts has been gripped by the stories of these two men, and we treasure the opportunity to have been able to hear them first hand. I have known people with war stories who were dear to me pass away, and their recounts of these stories passed on with them. Here I consider myself privileged to have heard these new accounts.